Safety, Privacy and Security. Our RFID blocking pop up credit card holder wallet can perfectly block unwanted RFID scanners, includes RFID blocking technology to prevent unauthorized access to personal information, Protect your RFID Credit Cards, Debit Cards, ID Cards from electronic pick pocketing. It is very secure and is perfect for travel. This is a fashion and practical secure RFID blocking wallet, it makes everything so well organized. It includes a metal case compartment with pop up button that can holds about 5-6 cards, plus has 2 additional inside pockets that could be used for other cards, and a compartment for holding cash or bills. This RFID card holder holds everything you need! It is also the perfect size to slip in your front or back pocket, that is not bulky. Perfect men mini wallet to just grab and go. Special design - Leather + Aluminium Combination. This card holder wallet is made of premium aluminium and leather, high level of craftsmanship, durable and novel, fits for men. This credit card holders have RFID functionality, will protect your essentials from be stolen, such as ID card, Credit card, Debit card and other RFID-chipped cards, so you don't worry about electronic pick pocketing. Our lightweight and compact wallet features a unique, cool and convenient pop-up function that will make finding the right credit card effortless and extremely fast! Someone that carries only a few bills, relies primarily on a few credit cards, keeps no business receipts; this wallet would be perfect. But if you carry more, this cute little wallet becomes cumbersome to close. 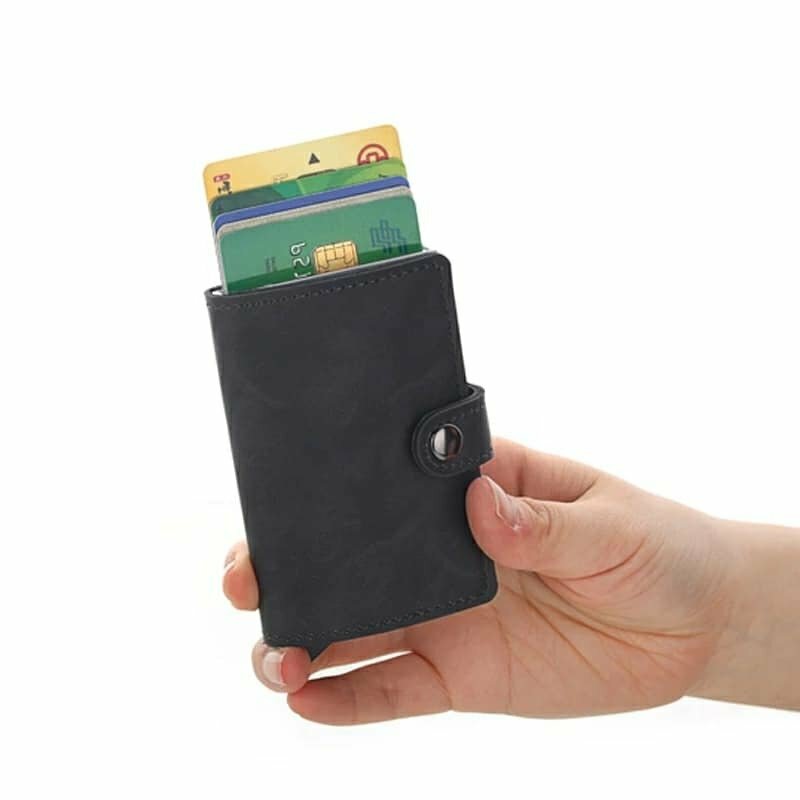 This small credit card wallet can be given as a perfect gift for him on Birthday, Valentine's day, Father's Day, Thanksgiving, Christmas, and all other holidays!